For years, Acer has made some of the best Chromebooks you could buy, and with the new 2-in-1 Chromebook Spin 13, Acer is keeping the newfound flexibility found on last year’s R13, while upping the ante with a new an all new, more premium feeling design. The Chromebook Spin 13 sports both USB-A and USB-C ports, and a microSD card reader, which is more than what you get on a lot of modern laptops. Taking a cue from the Google Pixelbook, the Chromebook Spin 13 features a 13.5-inch 2256 x 1504 touchscreen with a 3:2 aspect ratio instead of a traditional 16:9 ldisplay. Then, Acer went and replaced the big long hinge on the R13 with a more standard two-sided setup, before tacking on a new one-piece Gorilla Glass touchpad. And unlike Acer Chromebooks of old couple years ago, the Spin 13 sports a full metal chassis that should give it some added durability and a touch of class. The Chromebook Spin 13 shouldn’t be hurting on power either thanks to your choice of 8th-gen Intel Core i3 or i5 CPUs, up to 16GB of RAM, and either 32GB, 64GB or 128GB of storage. The Spin 13 even features built-in Wacom stylus support (including an onboard hidey hold for stashing the active pen when its not in use), so you can save handwritten notes or sketches with ease. But perhaps the best thing about the Chromebook Spin 13 is that it looks like its going to cost half the price of Google’s slick, but expensive $1,000 Pixelbook. While official prices have yet to be announced, I’m expecting prices are going to start around $400 for a non-2-in-1 Chromebook 13, while the 13 Spin will command a $100 or $150 premium on top of that. 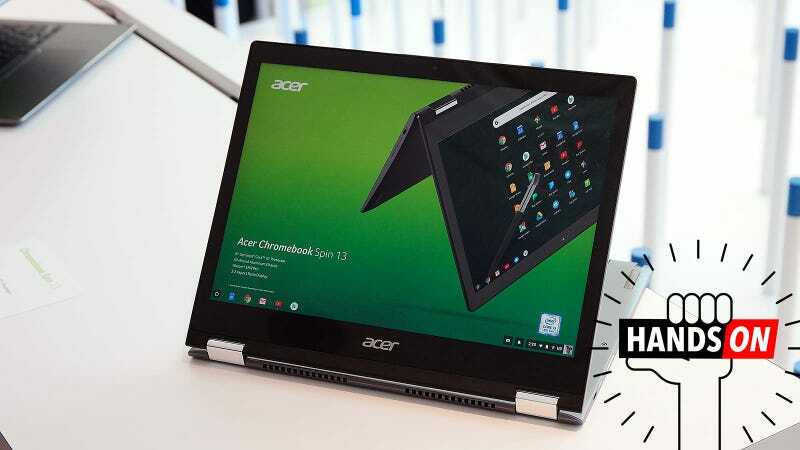 And just in case you wanted something slightly bigger, Acer is also making 15-inch versions of its new Chromebook, including the new $450 Chromebook Spin 15, which Acer claims is the world’s first 15-inch Chrome OS convertible.